Welcome to my Clayberry Cottage Studio! 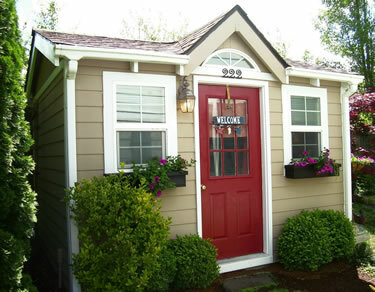 Clayberry Cottage was founded in Sherwood, Oregon. I started a business selling ceramic bisque pottery from my garage nine years ago so that I could stay home and raise my two growing boys. The business grew and I discovered I enjoyed painting on ceramic bisque to create gifts for my family and friends. Through word of mouth, I started Clayberry Cottage. My goal is to create whimsical, colorful, personalized gifts for your special occasions. Today, working from my cottage studio, overlooking a beautiful garden inspires my designs and colors. Each piece is created by me, with love and warmth and is personalized as your special gift. Children, grandparents, friends and neighbors appreciate personalized ceramic pottery for all occasions. Photo Above: The cottage studio where Clayberry's personalized gifts are created. 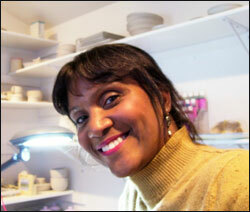 Photo Left: Dorothy Taylor in her studio where she paints the beautiful ceramic gifts.